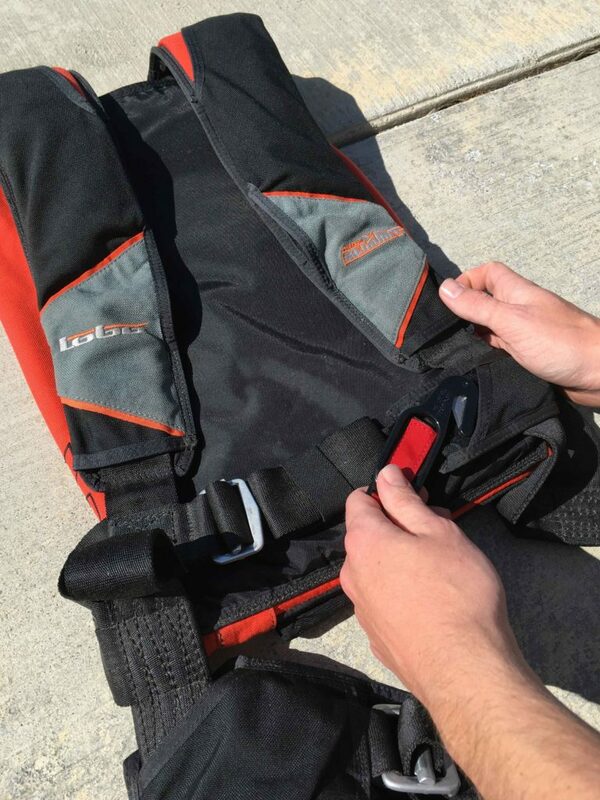 The careful washing of harness/container systems has been practiced for decades in the parachute industry. 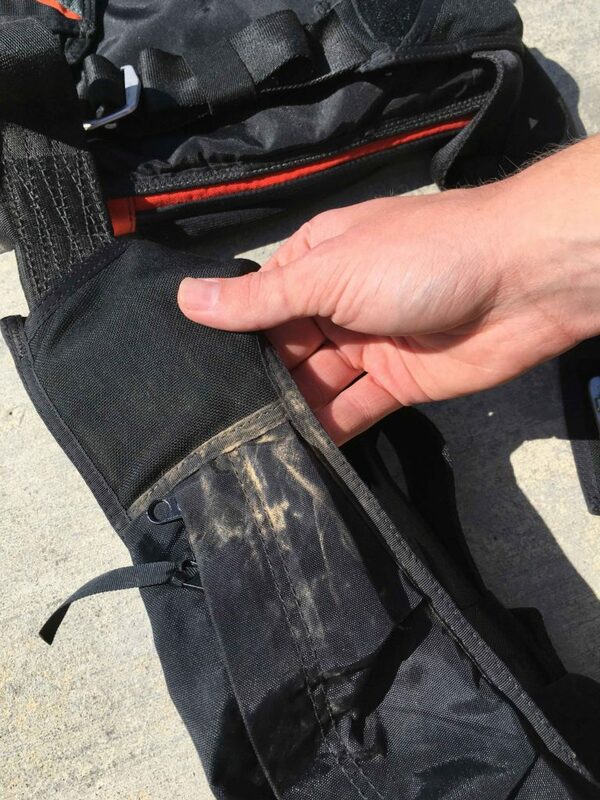 While there is evidence that suggests washing a harness reduces the strength of the webbing, in real world applications, the reduction does not appear to be enough to be problematic. The information below pertains to a rig that uses common parachute industry materials. 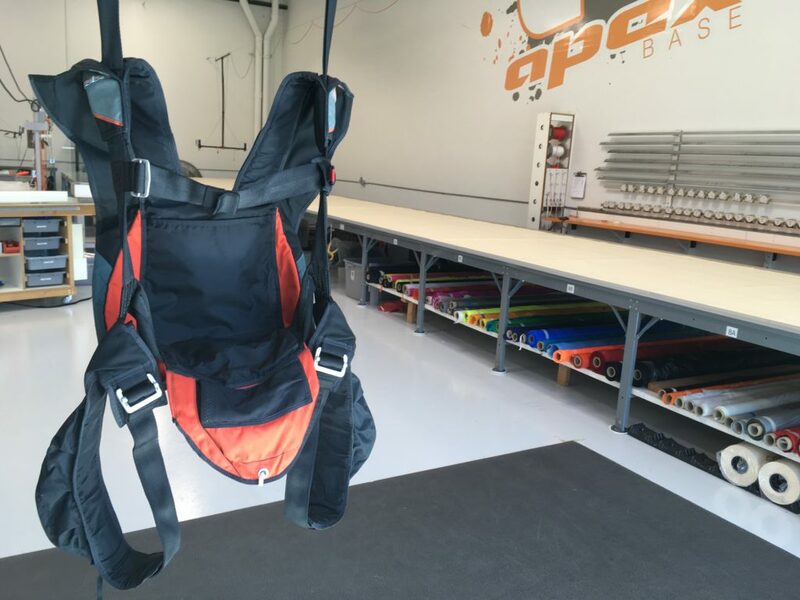 In recent years materials not traditionally found in the parachute industry have found their way into BASE harness/container systems. 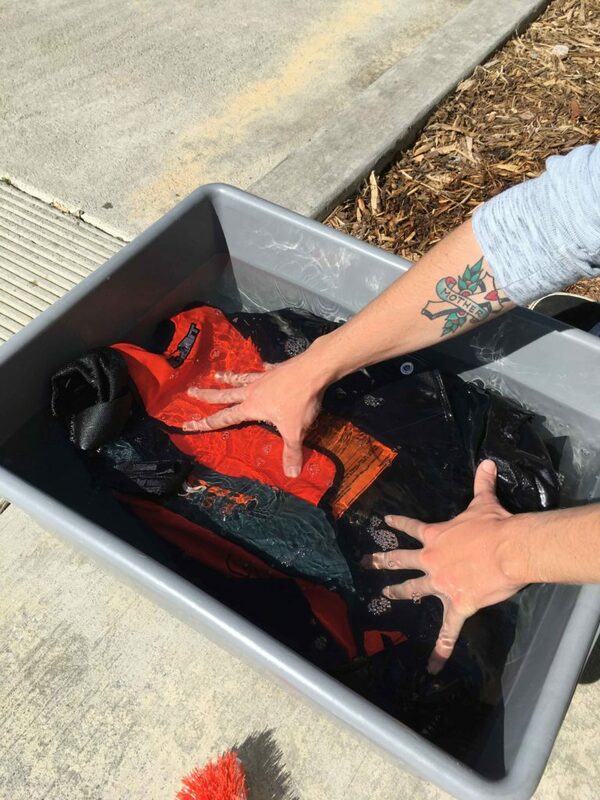 We cannot speak as to how those materials may be affected differently by washing and encourage you to reach out to the manufacturer of your gear if you have any uncertainty. We’ve heard of different methods for washing including the use of a washing machine and even using a power washer. We’ve never used either of these methods so we can’t recommend them, although it seems intuitive that they might be sub-optimal. Strip off all components. (Hook knife, hook knife pocket, cutaway handle, D30 back protection, etc.) If you’d like to wash any of these components we recommend washing them independently from the rest of the container. Dis-assemble canopy from container at the hard/soft links if you’ve got integrated (built-in) risers, or at the 3 rings if you have 3 ring risers. Do not wash your canopy. We know we shouldn’t have to say that… but we’re going to go ahead and mention it anyway. 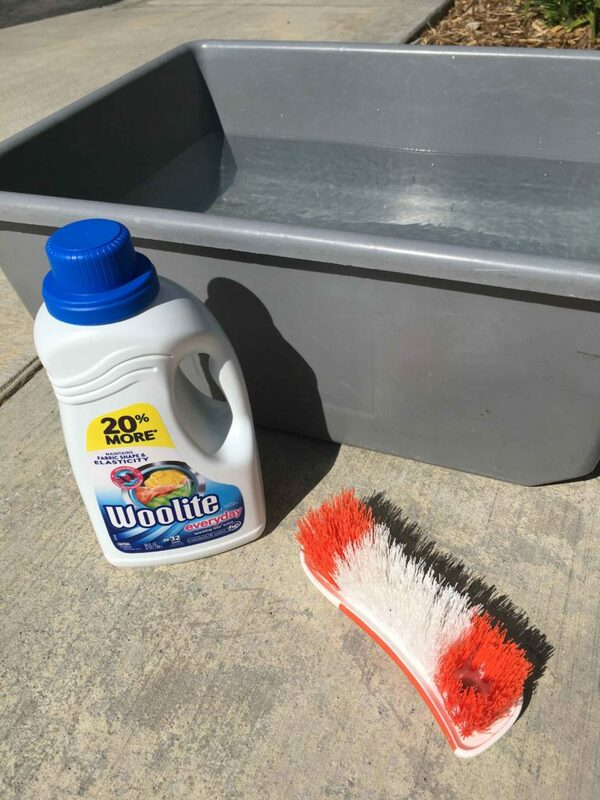 While your container is still dry, be sure to identify heavily soiled areas that may need extra attention during the wash because they can be harder to see once wet. We recommend using a large tub of cold water, Woolite Fabric Soap, and a soft-bristled brush. Completely submerge the rig in water, add soap, and scrub as necessary. Empty the soapy water and replace with fresh water to rinse. Submerge and squeeze the rig under the fresh water thoroughly. Repeat the rinse with new water 2-3 times or until you stop seeing soap in the rinse water. Hang dry your container. Ideally in a dry, well ventilated location out of direct sunlight. Squeeze excess water from lower part of the hanging container to expedite the drying process. Placing the rig in the airflow of a fan is also a good idea to help facilitate drying. Dry hardware with a towel. After a couple hours (or once it’s no longer dripping wet) make sure to adjust the flaps, and expose any hidden cavities on the rig. Occasionally locate the dampest areas and adjust the container to get them fresh air. Never put a rig away that is not completely dry. Mold can grow quickly on a container in a damp stash bag. Drying times vary greatly. Sometimes in the hot summer months it only takes a day or two. But if humidity is high it can take several days or longer. Remember, be patient! Putting your rig away wet will do more harm than the wash did good, so try not to sabotage your hard work! 4. GUARD: Scotchgard is a useful tool in extending the results of your wash. Be sure not to coat the harness webbing and only apply it to the container fabric. If this sounds like too much work, find a local rigger! Do it right, do it once!